Explanation: To create a sonata from supernovae, first you have to find the supernovae. To do that composers Alex Parker and Melissa Graham relied on the Canada France Hawaii Telescope (CFHT) Legacy Survey data of four deep fields on the sky monitored from April 2003 through August 2006, adopting 241 Type Ia supernovae. Enchanting to cosmologists, Type Ia supernovae are thermonuclear explosions that destroy white dwarf stars. Then, they gave each supernova a note to play, the volume of the note determined by the distance to the supernova. Fainter, more distant supernovae play quieter notes. Each note's pitch was based on a stretch factor measured by how fast the supernova brightens and fades over time relative to an adopted standard time history. Higher stretch factors play higher notes in pitches drawn from the illustrated Phrygian dominant scale. 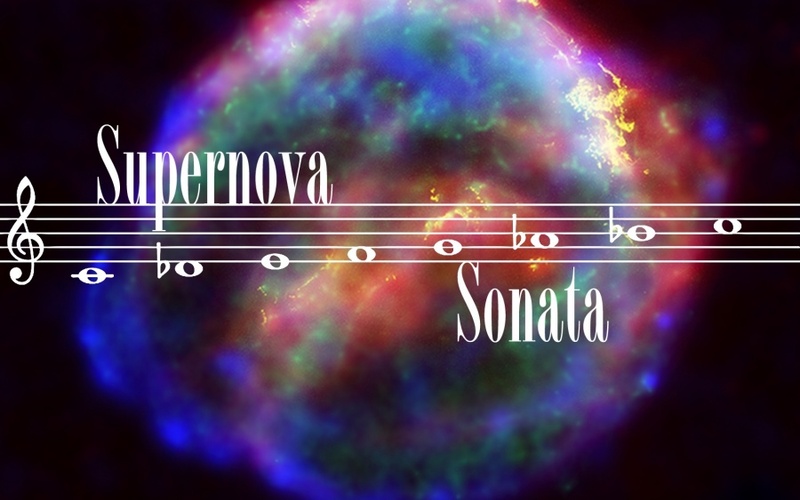 Of course, each supernova note is played on an instrument. Supernovae in massive galaxies were assigned to a stand-up bass, while supernovae in less massive galaxies played their note on a grand piano. Click on the image or follow these links (Vimeo, YouTube) to watch a time compressed animation of the CFHT Legacy Survey data while listening to the Supernova Sonata.